Swarm is the opening cinematic for StarCraft 2: Heart of the Swarm, the second chapter in the StarCraft 2 trilogy. And in this terrifying journey from the skies to the ground, we finally get to see the Zerg completely overwhelm a city. 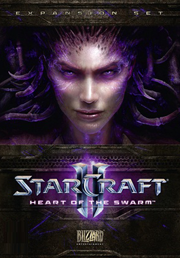 The StarCraft game series is an incredibly complex real-time strategy game. But the scale and fantastic nature of the art elements (characters, buildings, environments) are mostly left to the imagination. The game requires that the unit designs be quick reads for gameplay reasons. This means that proportions, silhouettes and texture coloration be calibrated for fast-paced gameplay. Of course, the in-game art is extraordinarily well done, but it serves gameplay before art (just as it should). In contrast, the art we see in the cinematics aren’t bound by game design or engine restrictions, so the cinematic artists are able to fully realize these characters and environments in all their glory. In addition to setting the mood and story for the game, StarCraft 2 cinematics give players a chance to see their beloved units up close and personal. It started with the StarCraft 2: Wings of Liberty teaser where we got to watch a lowly marine suit up in spectacular fashion. And every subsequent StarCraft 2 cinematic has shown us something that we’ve never seen before. 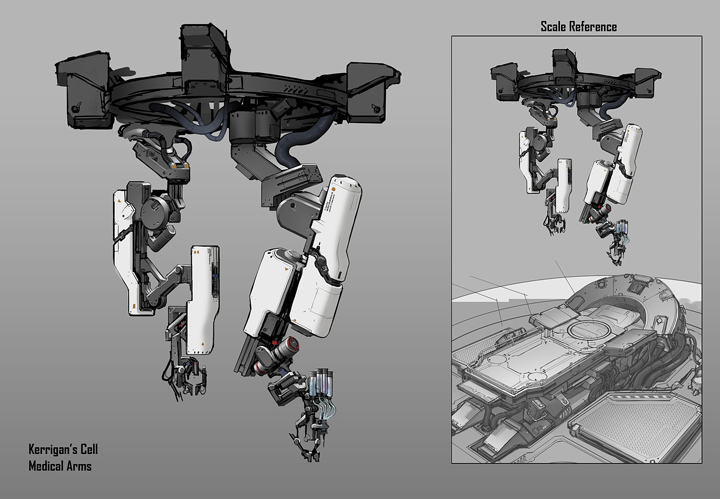 Medical arms for Kerrigan's cell. Sr. Project Producer: Phillip Hillenbrand, Jr.